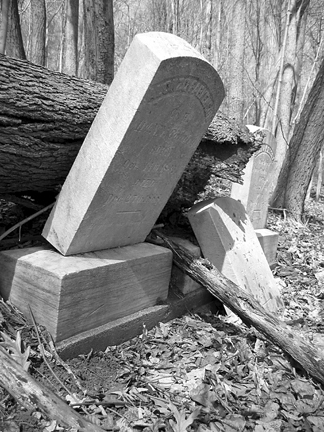 Several years ago I happened upon an abandoned cemetery in Central Nyack. It is located behind Nyack Lumber on Rt. 59. The USGS topographic map labels it "Rural Cemetery". I always wanted to go back to take pictures of the site but didn't get around to it until yesterday. I was inspired by the Forgotten NY tour of Prospect Cemetery, an abandoned cemetery in Queens. Photos of Prospect Cemetery can be found on Satan's Laundromat. There is no parking at the Central Nyack cemetery. You park at either Nyack Lumber or the mini-mall next door. There is no sign for the cemetery and I couldn't find a fence or markers to outline its size. The area outlined on the topo map is much larger than what I wandered through yesterday. Maybe a return trip is in order. The most recent grave I could find was from 1982. Not that long ago. Most of the other graves were from the 1890s or early 1900s. Many headstones were next to grave-sized holes in the ground. I assume those bodies have been disinterred and moved elsewhere. The site, as you will see, is overgrown with trees and underbrush. Update: According to the Genealogical Society of Rockland County list of cemeteries, the name of the cemetery is Nyack Rural Cemetery. It was an active cemetery from 1837 to 1977 (yet I saw a grave dated 1982). There are two listings in the genealogical society's listing: one of 268 graves, the other of 67. My grandmother once told me that i have several relatives buried in that cemetery, or at least they were. My gradparents samuel handley and his wife bessie wilks lived on pine st central nyack. Are ther any handley, wilks markers? I don't know. I've only been there a couple of times and not for a few years now. Sorry. In 1959 I went with my fagther and his two brothers with the remais of their mother (my grandmother) to that cemetery. Your photos were shocking to me (54 years later) I am in Washingto State and I amopig to visit the site in the next year or so. Who controls or is responsible for the property? Thanks.